Absolutely gorgeous detail. Perfect for my sunflower themed kitchen. I have a deep love for artwork related to landscapes and art that speaks to me as well as complimenting my home. Every room has a theme of like to think. Warm and welcoming. This was perfect. The colors are bright. Some sunflowers appear stressed or at the phase of their ending. Maybe this is why this peice called out to me. It’s cheerful, yet natural. What most flowers appear to be once placed into a vase. Very realistic. Worth every cent. It’s perfect in every way !! 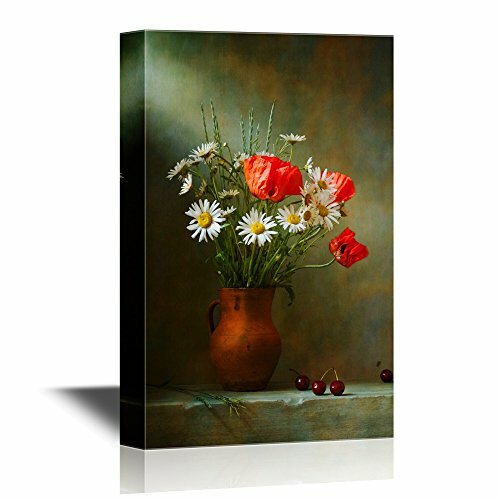 Good quality wrapped canvas art. Colors are true to picture. Excellent wall piece! I bought two of them! Couldn't be more pleased! This art work is lovely and I am so pleased with it. looks much more expensive than the price I paid. Thanks, will definately order from you again. Excellent Canvas wall Art paint!!! It looks grace on my kitchen wall.